We continue to be in awe of the kindness and generosity of our community here in Canada. Our 2nd Annual Fundraising Gala on October 4th, 2014 raised over $38,000 to help us continue with our work. 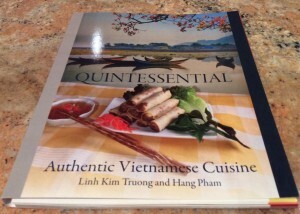 Our second year also saw the printing of our very first cookbook, Authentic Vietnamese Cuisine, written by our talented house chefs, Linh Truong and Hang Pham, and funded by the Davies Tran-Davies Corporation. It was a labour of love by the whole team which included Nhung, Grant, Justine and Michelle. There were many late-night editing and reediting through the summer months because we knew 100% of the funds from the sales would go towards helping our children in Vietnam. We were so grateful when we saw how well-received the book was. In November 2014, Dr. Nhung Tran-Davies traveled back to Vietnam to do site visits of our projects, to meet the children, and to learn more about how best to help the impoverished children. Accompanied by our Vietnamese Rep Yan Chen, Nhung was able to visit Mai Am Tin Thac (an orphanage in Bao Loc, five hours north of Saigon), Kon Kloc Early Development Centre (a kindergarten building we helped build in partnership with the project lead, the Vietnamese Education Society), Dak Glei residential school (a remote boarding school for girls in central mountainous region headed by a Sister Loan), Vinh Long orphanage (an orphanage 3 hrs south of Ho Chi Minh) and Mai Am Thien Duyen (an orphanage in Cu Chi). In March 2015, Amanda Tran was in Vietnam and was able to present the students at the Truong Nuoi Day Khuyet Tat (School for the Disabled) in Ca Mau (a city at the southern tip of Vietnam) with 13 hearing aids to help the hearing impaired students learn. She also met the children at the Bao Tro Xa Hoi Ca Mau (Ca Mau orphanage) and presented them with five wheelchairs to help the disabled children there gain increased mobility. Amanda also stopped in to meet the children at the Niem Phat Duong Hung Phuoc temple to see the beds and study tables we had purchased for the children there. In May 2015, Michelle Ngo visited three orphanages, Mai Am Thien Duyen (Cu Chi), Nha Tinh Thuong Dieu Giac (an orphanage in Ho Chi Minh), and Trung Tam Huong Duong (an orphanage/residential school in Binh Duong) and brought them each a television set to help provide the children with some entertainment. In August 2015, Linh Kim Truong made site visits to Mai Am Tin Thac (Bao Loc), Mai Am Thien Duyen (Cu Chi), Vinh Long orphanage, and Mai Am Thin Tinh Thuong (a residential school in Ca Mau). She, along with our reps Yan Chen and Hoang Nguyen did a tour of the schools to present school supplies and scholarships to hundreds of students throughout central to southern Vietnam: Hue, Ho Chi Minh, Dak Glei, Tien Giang, Can Tho, Binh Thuan, Ninh Thuan and Ca Mau. A total of $16,000 in scholarships were granted by the CVBF this year to students from early elementary to postsecondary school. This year, we also carried out two large community projects to the remote mountainous Lung Cu Commune in Ha Giang and Phan Dung Commune in Binh Thuan. 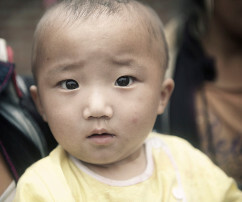 In Ha Giang, we brought warm sweaters, shoes, scribblers to over 300 children. And in Binh Thuan, we supplied nearly 300 children with textbooks, school supplies, bicycles and basic food supplies. In Quang Nam, under the direction of our rep Lyna Tran and the help of senior boy scout leaders and retired engineers, Vuong Do and Ba DeLinh, we helped build a new bathroom for Hoang Hoa Tham school. We also granted 21 new bicycles to the underprivileged students in the area. Throughout the year, our reps in Vietnam made regular visits to our beneficiaries to supply them with basic food supplies (rice, noodles, cooking oil, milk) and basic needs such as diapers and clothing items for the children. Our reps also brought smiles to the faces of the children at these orphanages with gifts at Christmas time. Overall, we had accomplished more in our second year because we knew better how to help the orphanages and schools in need of additional help for the children. We are grateful that our directors continue to devote so much of their time to this effort, especially when it is through their own expenses. We are excited to have Huynh Anh Mai join as a Project Director and Shanni Thai as our Fundraising Director.